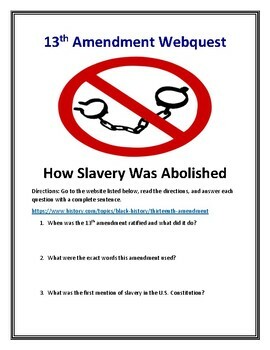 13th Amendment (Abolishing Slavery) Webquest With Answer Key! 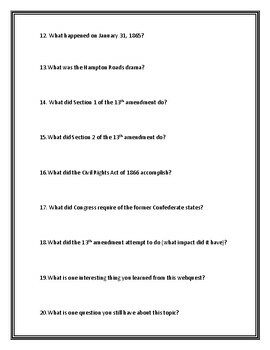 This 20 question History.com webquest will help students learn all about the 13th amendment (a "Reconstruction Amendment") and how slavery was abolished! 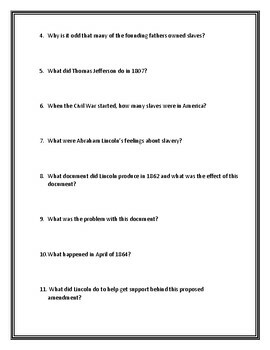 Information regarding the Emancipation Proclamation and why it was not effective. The events that led up to the 13th amendment being proposed. The process of ratifying this amendment and roadblocks Abraham Lincoln faced during this process. The impact the 13th amendment had on the nation. Students will love to learn all about this historic event through an independent webquest! An answer key is included for your convenience!